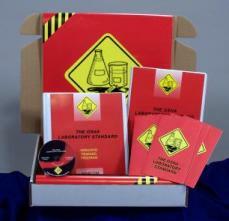 MARCOM's "The OSHA Laboratory Standard" Regulatory Compliance Kit™ addresses the three major areas needed to comply with the Standard... general information about the Standard itself, commonly used chemicals and safe chemical handling. This kit has been created specifically to assist facilities in fulfilling their 29 CFR Part 1910 (191.1450) OSHA Laboratory Standard employee training requirements. Materials in the kit include a video program, a compliance manual, five motivational posters, and 30 employee booklets. A compliance manual containing a "fill-in-the-blank" Chemical Hygiene Plan, as well as other materials needed to help meet compliance requirements, is included. The posters in the kit emphasize the importance of knowing about potentially hazardous chemicals. The videotape and employee booklets include information on background of the standard, the chemical hygiene plan, chemical hazard concepts, the Material Safety Data Sheet (MSDS), common chemical "families", characteristics and potential effects of chemicals, container labeling, use of personal protective equipment, clean-up procedures, first aid, and more. The video program in the kit comes with a comprehensive leader's guide, reproducible scheduling & attendance form, employee quiz, training certificate and training log.